Beyond acoustics in music performance halls; a responsive sound system for architecture. My research on Music+Architecture started in 2003 with Professor Gulzar Haider at Carleton School of Architecture. Since then I have been meandering between the two arts/sciences [debatable.] This 6 year search has resulted in a number of art pieces, installations and architectural projects that I will try to dig out and add to this blog as I go. During these years I have learned/worked/collaborated with many different artists,professors, students. hopefully I will get chance to mention their contributions when I talk more about the projects. It is my goal to keep this research as collaborative as possible and make it a platform for open-source architecture. 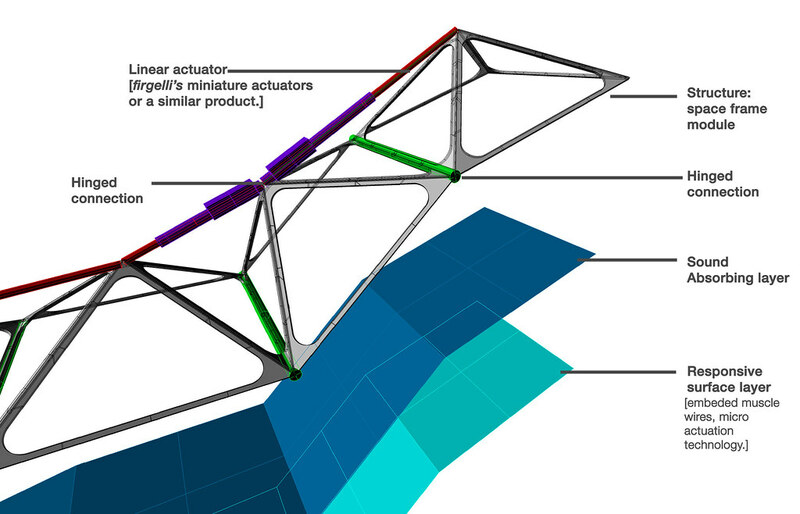 The Tunable Sound Cloud is a proposal for a layered three dimensional dynamic spaceframe that adjusts to it’s environment with linear actuators driven by micro-controllers. 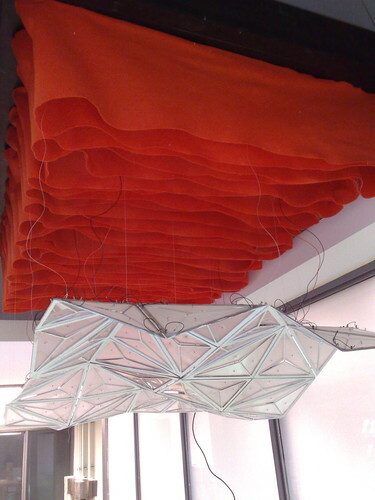 The self-supporting structure, being a ceiling application, is made of an array of triangulated modules that are hinged to one another and folds on itself.The responsive surface layer, actuated with memory alloy wires (muscle wires) will control the apertures of the surface to adjust sound reflection or sound absorption to enhance the acoustic performance of the space. Looking at music in different time periods, from dark ages to baroque, high classical era to twenty first century experimental music, there is a relationship between the architecture of spaces music is composed and performed and how the music is written. In today’s modern or trans-modern era we design we design multi-purpose performance halls and spaces that are so generic that could accommodate any music and program. I will be looking at responsive systems in architecture and music to design a tunable performance space that could be adjusted to meet the absolute sound requirements for a specific sound performance. Special characteristics of that era: Sound/Acoustical engineering,More color and tone in the music, Wagner designs the 1st opera house for his own performance. 1924 grand opera dies; Turandot, puccini. Special characteristics of that era: Music becomes an multimedia performance enhanced by electronic devices. 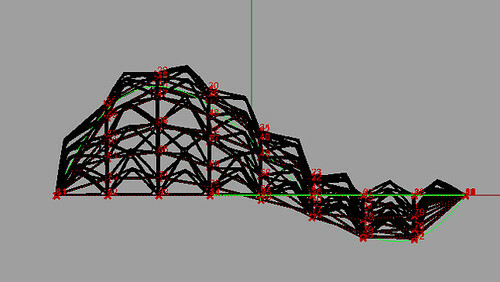 The structure is based on a series of hinged triangular spaceframes, connected and actuated at the top center of the frame to the adjacent frames. 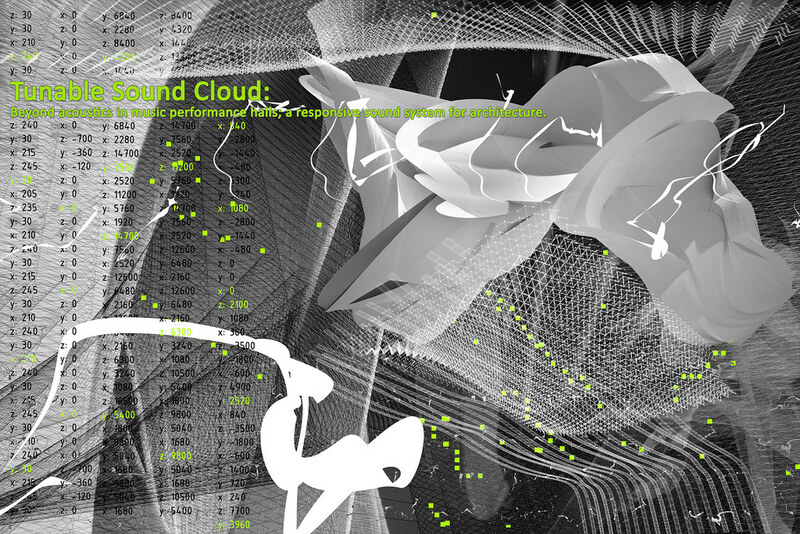 Tunable Sound Cloud; Responsive Surface Study from Fishtnk on Vimeo. Above is a study of the surface movement with Nitinol wires to control the sound behavior for the Tunable Sound Cloud Project.This study is designed as a 10X10 grid of micro responsive modules [10X10mm units] to control the acoustic properties of the surface. Tunable Sound Cloud, prototype tile from Fishtnk on Vimeo. below is a study of the system, interfaced through Grasshopper and Rhino modeling platforms, the ceiling structure of the Tunable Sound Cloud is controlled and adjusted to accommodate different acoustical settings. Actuated with Arduino micro-controller and servo motors. Why do you totally disregard non establishment forms of music in your ‘history’? Not sure what you are referring to as “Non establishment” ? and just clarify this research makes no claims in regards to history. History has been referenced as a precedent and a starting ground for this project. The TSC was a case study of sound performance in Opera houses and western music halls. Purely based on the amount of data and information available on western classical music and the methodology that it has had throughout history it makes it an easier candidate to analyse and theories. The structure and fundamental values of the music that you may be referring to as “non establishment music” would have major clash with the classical western approach to music. I emphasize the western classical music is a very specific and small niche of music history which with the help of the christian church it has been very well documented throughout the history. The music that was studied for this exercise was selected based on the amount of non-subjective and bias documents available. Knowing music is the most abstract art form, some debates become irrelevant if the discussion is on branches of this sophisticated art that don’t have fundamental commonalities. As an example East has a very different approach to music and sound than west. Folklore, gypsy or even street music have a completely DNA than the studied fraction of the world music. Having said that, the goal of an instrument such as the TSC is to broaden the spectrum of sound available in contemporary music performance spaces. The sound rage made available by the TSC is absolutely dynamic and should be calibrated to expand the pallet available to the musician and the audience beyond western classical music. History is just what we happen to have access to know about our past, while there is a lot of value to it, it is not absolute. In some ways it is an abstract aroma of what may have happened in the past. Now we just use it as a reference. Thanks for showing your interest in this topic!